PFM HQ Building – The recent freezing weather did take its toll on several of the buildings on the Kingsbury property. An exposed PVC pipe serving a faucet on the back corner of the old hangar broke, and part of the water inlet to the PFM HQ trailer froze, though it didn’t break! Terry Bledsoe and John van den Eynde teamed up to replace and insulate the faucet pipe and thaw and insulate the PFM HQ inlet pipe. We should be in good shape for many years! 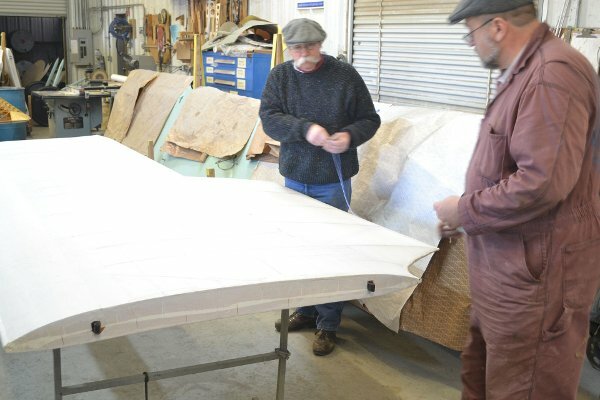 Dormoy Bathtub – David and Ian Whitaker continued working on fuselage fittings, while starting to cover tail surfaces. The fuselage is largely reassembled and functional and they were in the process of re-installing components in preparation for covering. During the workday they also started covering the tail surfaces, horizontal stabilizer and rudder in particular. Fokker Dr.I Triplane – Tammy Orloff had sewn three out of the four seams on the Triplane fuselage’s envelope, so she and Diane Edgerly showed up with a sewing machine to finish sewing the job! After a series of adjustments the final seam was sewn and the envelope test fitted for the final time. We need to add the cheesecloth to the wooden cheeks and the turtle deck before putting the envelope on for good! Dave Edgerly devoted much of his day to installing the tail skid, complete with shock cord. Diane helped Dave with seizing the ends of the cord into loops and test fitting the results. It was a trial and error situation as the initial fittings revealed that the cord was too long and too stiff, plus there were previously unrecognized interference problems. By the end of the day the issues were all resolved and we have a steerable tail skid installed! Thomas-Morse – Dave Orloff and Kevin Monahan continued working on the last wing panel, getting it marked and punched for rib stitching. Tammy and Diane made envelopes for the last set of ailerons, which need full refurb before covering! Jim Johnson will likely be going out to Kingsbury during the week to work on the rib stitching, tape application and dope process for the various wing panels. Right now the wing panels and tail surfaces for the two aircraft are all in different stages of completion! Tom Gaylord blasted clean T-1 cockpit components, all related to the rudder bar and asked Dave Orloff to paint the parts, which he graciously did! Team Vehicles – Cameron Whitaker and Al Sumrall (with Roger Ritter) made additional improvements on the Model T Ambulance T, filling the radiator with water / anti-freeze mix and exercising the vehicle some. Other work may have been done but I am not aware of it, so once again we’ll have to rely on Al to flesh out the picture! I do recall seeing the ambulance motoring about with tribute bikes whizzing about like angry bees!